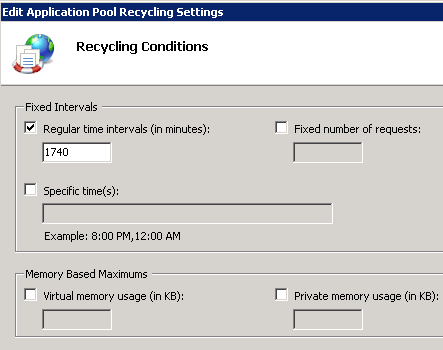 The default application pool recycle is "Checked-Regular time intervals in minutes" with a default value of 1740, which is 29 hours. So the question is, when the application pool recycles, does it crap on anything that is currently running or does it shutdown gracefully then recycle? IIS uses staggered shutdown - it starts a new instance and routes requests to the new instance, but any requests that are still running will complete on the old instance. If you're running Web Connection that's all that's needed. If you're running ASP.NET applications you might have to content with Session state getting blown away on a recycle operation. I'm not sure if it mentions it in this guide or not but you'll also want to set the ASP.NET State Service to Automatic under the Services for the web server. The best strategy is not using Session state at all. Using Auth/Identity you can track a user along with some small bits of data (username/name/level etc) stored in an encrypted cookie and that avoids the overhead of Session state services.